HEXAPRO™'s 6 highly-bioavailable proteins are fast, medium and sustained release proteins that ensure high amino acid levels with both short and long term delivery. Each Protein has been carefully selected to achieve maximum protein assimilation and absorption. HEXAPRO™ is also fortified with 5 Amino Acids to enhance recovery, including all 3 BCAAs essential for protein synthesis and providing a rapid energy source for muscles. Widely considered to be one of the best, most highly bioavailable proteins, WPC is rapidly assimilated providing a surge of amino acids to the body to accelerate recovery and boost protein synthesis. A unique combination of 80% Casein Protein and 20% Whey Protein, MPC provides a slower delivery of protein due to the unique properties of Casein. Considered by most to be the ultimate in protein supplementation due to its exceptionally rapid rate of absorption and delivery. The slowest rate of absorption, providing amino acid delivery for up to 7 hours. This ensures that you can stave off muscle breakdown due to lack of amino acids for a much longer duration. Made from pure egg whites, the albumin component is considered a medium-rate digestion and assimilation. Hydrolyzed Whey has an extremely fast rate of assimilation. Hydrolyzed Whey has gone through the process of being broken down into Mono, Di and Tri peptides and provides HEXAPRO™ with peptide fortification with ultra-rapid assimilation. 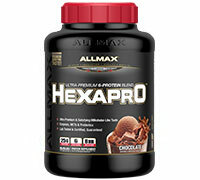 HEXAPRO™ has a truly rich, thick milkshake-worthy taste that will make you re-think Protein. Delicious and satisfying taste, HEXAPRO™ creates an experience that will make you fall in love with Protein all over again. 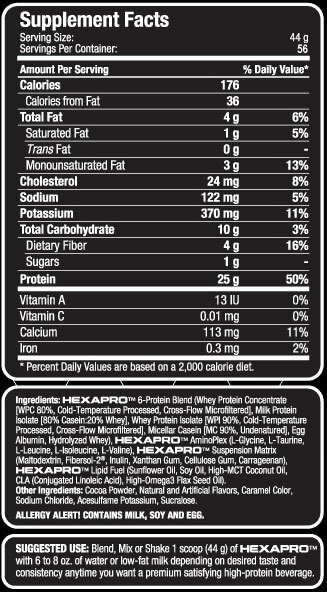 With taste like this, you will want to make HEXAPRO™ a part of your daily routine. Getting your Protein fix with this kind of regularity will help you achieve any goal. Every athlete, fitness competitor or bodybuilder will tell you that frequent feeding is essential. HEXAPRO™ makes getting extra feedings into your schedule delicious and extremely convenient. With 6 High-Quality Proteins blended together in an ideal ratio to provide fast, medium and slow delivery, HEXAPRO™ delivers truly, satisfying, protein with a taste that defies the term "Protein Shake".